With our PENESEAL liquid sealers are designed to permanently protect, preserve and strengthen concrete as waterproofing treatment (for exposed concrete e.g. roof slabs) as well as a concrete floor hardener. A surface-applied, integral crystalline waterproofing material, PENETRON is used for waterproofing and chemical protection at above and below ground level.PENETRON is applied by brush or spray to either the positive or the negative side of the concrete and in the presence of moisture penetrates deeply into the structure. The ensuing chemical reaction fills microcracks, pores and capillaries with an insoluble crystalline formation, which prevents water and water-borne chemicals from entering, even under high hydrostatic pressure. Cracks that develop during the lifetime of the concrete are resealed by PENETRON, resulting in permanent concrete protection. PENETRON ADMIX SB is identical to our 3rd generation crystalline admixture, but packaged in convenient, pre-measured soluble bags for easy application when adding the product to the new concrete batch. As a quality guarantee, PENETRON ADMIX SB features our unique ‘green tracer’ indicator to signal that genuine PENETRON ADMIX is in the mix. Once inside the concrete, PENETRON ADMIX SB reduces permeability by permanently sealing micro-cracks, pores and capillaries. This protects the concrete against water penetration and effects of deterioration, even under high hydrostatic pressure. 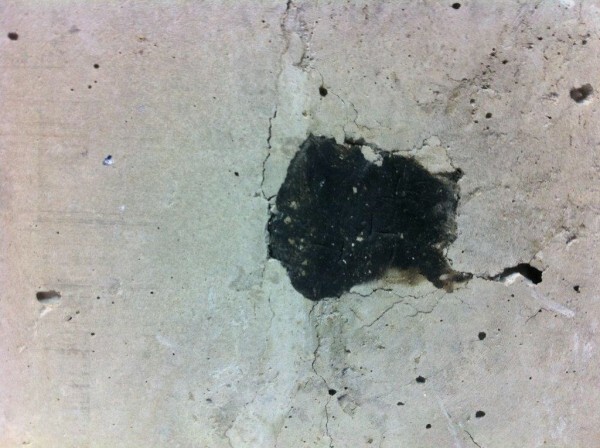 It provides projects with a self-healing capability to reseal cracks that develop during the lifetime of the concrete. PENETRON ADMIX SB is compatible with all commonly used workability admixtures (e.g. superplasticizers, retarders) and mix design formulations (trial mixes recommended prior to casting). PENETRON ADMIX RP is our tried and true Penetron Admix formulation with the addition of red pigment to meet the specification requirements of certain precast underground markets. 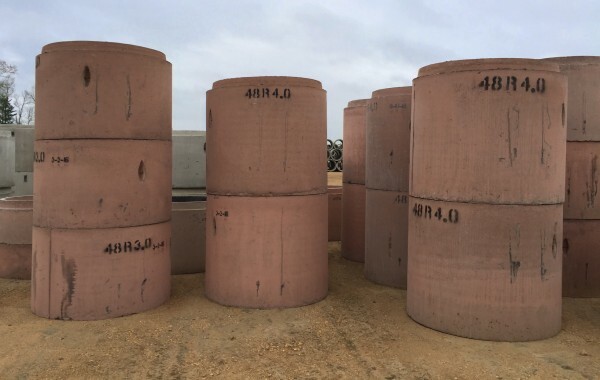 Packaged in convenient, pre-measured soluble bags for quality control and easy application, PENETRON ADMIX RP is ready to use when adding product to the new concrete batch. As a quality guarantee, PENETRON ADMIX RP features a red pigment to permanently color the concrete to ensure visibility at a distance during inspection and to signal that genuine PENETRON ADMIX RP is in the mix. Once inside the concrete, PENETRON ADMIX RP reduces permeability by permanently sealing micro-cracks, pores and capillaries. This protects the concrete against water penetration and effects of corrosion deterioration, even under high hydrostatic pressure. It provides projects with a self-healing capability to reseal cracks that develop during the lifetime of the concrete. PENETRON ADMIX RP is compatible with all commonly used workability admixtures (e.g. superplasticizers, retarders) and mix design formulations (trial mixes recommended prior to casting). A rapid-setting, crystalline-based, cementitious compound designed to stopping active leaks even under high hydrostatic pressure.PENEPLUG is recommended as a waterproof plugging mortar or where rapid-setting is required. A unique integral crystalline chemical treatment to waterproof and protect concrete, PENETRON PLUS is specially formulated for dry-shake applications on horizontal concrete surfaces or precast segments where greater impact and abrasion resistance is required. Packaged as a dry powder compound, PENETRON PLUS consists of Portland cement, various active proprietary chemicals and a synthetic aggregate hardener (crushed and graded to particle sizes suitable for concrete floors).Once it is dry-shaken onto a fresh concrete slab and trowelled into the surface, PENETRON PLUS will penetrate rapidly into the setting concrete. With moisture from the fresh slab, crystal growth will take place deep inside the concrete body, providing a permanent seal against water penetration. An advanced crystalline-based two-component injection grout with integral crystalline waterproofing ability, PENETRON INJECT waterproofs concrete by filling and sealing deeply embedded voids, cracks and fissures.It is used to fill hollow spots and voids and add stability and strength to repaired areas. The extremely fine particle size of its ingredients allows PENETRON INJECT to penetrate into micro-fine, hairline cracks, pores and capillaries in concrete and permanently seal them with an insoluble crystalline structure. It has a very low, water-like viscosity that allows the material to be injected into extremely fine cracks and displace any water present under injection pressure. PENEBAR SW 55 creates a physical barrier against water penetration through cast-in-place concrete joints that expand (in a controlled fashion) when exposed to water.Its superior ability to expand and seal concrete joints allows it to replace the more passive tied in PVC water stop systems, which easily bend over during casting, and eliminate welding irons, split-forming and special shapes. Recommended for building foundations, slabs, retaining walls, storage tanks and other immovable cold construction joints, PENEBAR SW 45 is a unique sealing compound designed to expand rapidly when exposed to water.It is an ideal self-healing joint material for construction joint applications. 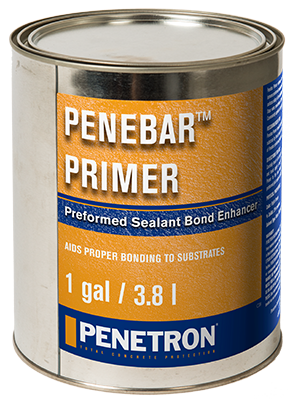 PENEBAR™ PRIMER enhances the bonding between pre-formed sealants, like PENEBAR™ SW, and concrete surfaces aiding in the installation process. Quickly and conveniently applied at the job site by a simple brush application. A clear, reactive penetrating sealer designed to permanently protect, preserve and strengthen concrete and masonry building materials, PENESEAL FH penetrates deep into concrete surfaces and reacts with the elemental concrete ingredients to solidify them into a harder, denser, stronger concrete mass. Alkali salts and minerals are flushed out in the process, eliminating efflorescence and leaching, and increasing bonding of surface coatings. A spray-on liquid sealer that forms a barrier to seal hairline cracks and protect concrete against water penetration, PENESEAL PRO creates a sub-surface gel that seals the pores, capillaries and cracks. The product remains active as long as water is present, sealing any future hairline cracks. Because of its ability to withstand thermal stress, PENESEAL PRO is ideal for concrete roofs, podium decks, bridge decks, terraces, traffic bearing structures, runways and driveways.